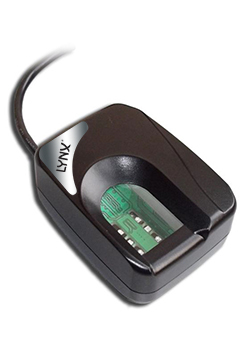 LYNX’s LS80H USB2.0 Fingerprint Scanner uses advanced CMOS sensor technology and precise optical system to deliver high quality fingerprint image. It can capture an almost un-distorted raw fingerprint image into PC in 100ms. So it is good for any fingerprint recognition application. The finger is illuminated by 4 infra-red LEDs during scanning and the light intensity is automatically adjusted according to scanning fingerprint’s characteristics (wet, dry, blurred, etc) to optimize the quality of the captured fingerprint image. Special electronic circuit is built into LS80H to do Live Finger Detection (LFD). With appropriate software in PC, user can select this LFD feature so that only live finger’s fingerprint will be scanned into PC. Fake fingers made from silicone rubber, play-doh, etc, will be rejected. And the LFD feature is included in all LYNX’s standard software. LS80H is OEM module of LS80H for customers who want to integrate LS80H into their own products, such as handheld POS machine and portable voter registration station. It is same as LS80H but without plastic shell and USB cable so that it can be embedded into any target system. It does not support Live Finger Detection(LFD). LS80H size is 56(L) x 45(W) x 19(H) mm and weight is 80g. Please contact LYNX for detail mechanical drawing.